The holidays were wonderful this year. The weekend before Christmas we made a trip to Pittsburgh to visit James and Emily (and housemates Kelly and Alma the cat) and to exchange gifts. We had dinner at Emily’s mom’s place (yum!) and the next morning we had brunch at Zenith on the Southside (yum!) and then headed back home. It was a lovely time. And there were presents! and a pair of fingerless mitts in Brown Sheep Nature Spun wool in Bulldog Blue. Simple K3 P1 mitts for James, modeled by yours truly. James was very happy with his new sweater. It wasn’t a surprise. He had approved the yarn last summer and tried the sweater-in-progress on over Thanksgiving. But he was very happy with how it turned out, especially with how well it fit. 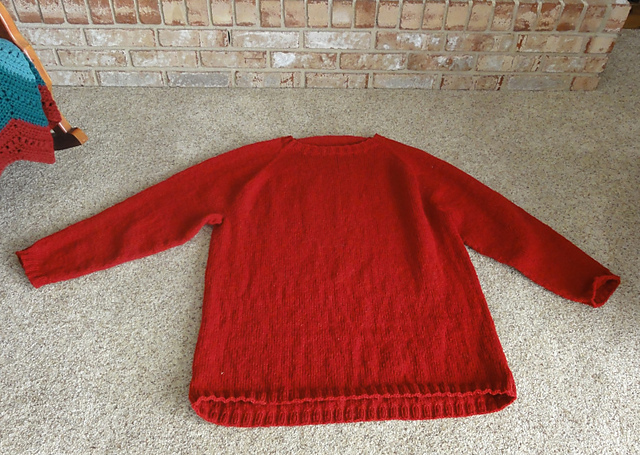 I added three double sets of short rows to the back, one at the shoulders, one at the bottom of the armholes, and one above the bottom ribbing to add length to the back. The short rows at the shoulders gave a slightly rounded shape that fit across his upper back very nicely. And the other two sets of short rows made the back about an inch-and-a-half longer than the front so the sweater won’t ride up in the back when he wears it. Emily also got a pair of fingerless mitts, knitted from Cascade 220 Heather in a lovely soft blue. I was working on these mitts over Thanksgiving, and Emily really liked them, so they mysteriously found their way into her gift bag. While James and Emily were showing off their fingerless mitts, their housemate Kelly was admiring them. So naturally, I asked him if he would like a pair. He said yes, so I told him to stop by when he was in town for the holidays and I would have a pair ready for him. Oh, and let’s not forget the best present of all. I actually made a pair of fingerless mitts for myself. All I can say is, Fingerless mitts, where have you been all my life? This entry was posted in Fingerless Mitts, Knitting, Sweaters and tagged Brown Sheep Nature Spun, Cascade 220, Knit Picks Wool of the Andes. Bookmark the permalink. Emily loves her Cassidy. It fits her perfectly and she wears it a lot. I love all your mitts. Great patterns and colors. Thank you. They were great fun to knit. Don’t you just love instant gratification projects like fingerless mitts!